Soothe dry lips and help seal in moisture with this set of organic beeswax lip balms. The non-GMO, all-natural ingredients—from the bees to the herbs—are grown on a certified B-Corp family farm and combined into balms that smell, and feel, amazing. Lips are soft, hydrated and smooth. I really like all the flavors, too. Have tried many others, but these beat them all. 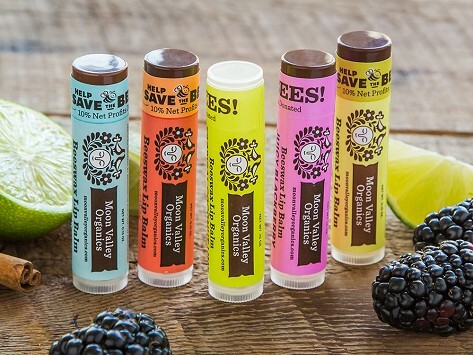 I've had recent lip damage from the sun and the Beeswax Lip Balm - Set of 5 by MOON VALLEY ORGANICS -- has helped heal the damage and maintained moisture on my lips. This is the second set I've had (the first was a gift) and I keep them handy wherever I need them. This product exceeded my expectations, it is a lot better than Burts Bees or Dr.Bronners!!! I've ordered a set, but only opened and using the SWEET HONEY so far, so can not speak for all of them yet, but the SWEET HONEY IS SO DELIGHTFUL - YOU WANT TO EAT THAT!!! I CANNOT WAIT TO APPLY IT EVERY DAY! It is also very moisturizing and softens the lips skin, it does not feel thick, greasy or like a heavy wax residue as Burts Bees. The moisturizing effects last 24 hours, so you can just apply it once in the morning after brushing your teeth, but I do it twice: morning and night, because it's so delicious, that I cannot wait 24 hours till I apply it again!!! It literally brightens my day and boosts my mood - just the lip balm! And it is all natural and organic - NO NASTIES! CANDY IN A TUBE!!! I really enjoy these, they work great and have a smooth texture and the flavors are nice as well. Kim and Aaron Otto began making their own beeswax lotion bars and lip balms when Kim couldn’t find the just-right natural skincare for her sensitive complexion. Their certified B-Corp family farm, Moon Valley Organics, soon grew into a hub of organic skincare activity—or should that be “hive”? It all begins with Moon Valley's own beeswax and batches of their sustainably-farmed herbs. The Ottos have spent years learning which herbs grow best in their part of Washington, and honing perfectly balanced herbal combinations for dry skin. They carefully harvest the herbs at the just-right time to ensure peak potency for crafting them into organic essential oils. In both the solid lotion bars and lip balms, moisturizing beeswax is complemented by other skin-pleasing natural ingredients, like Vitamin E sourced from sunflowers, and organic essential oils blended in for their soothing properties, like calendula to heal dryness and comfrey to stimulate skin cell growth. When we tried Moon Valley’s goods, we couldn’t get enough of the texture and fragrance, and how wonderful it all feels on skin. And we felt good knowing we were using nothing but pure goodness—all courtesy of the Ottos' hard work.